An Ulster University graduate has turned her passion for yoga into a new start-up and will launch her first product to market this summer, aiming to export to yoga enthusiasts across the globe. 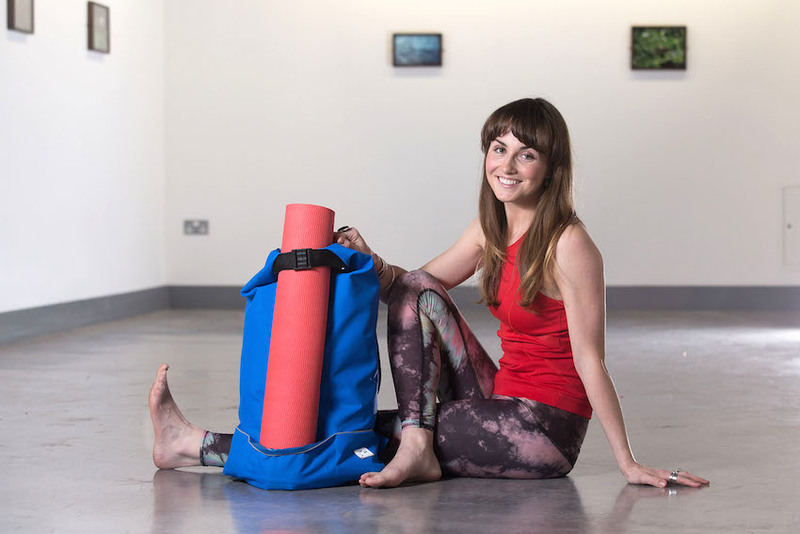 Multidisciplinary design graduate, Síofra Caherty, developed an innovative range of yoga bags as her final year masters project at Ulster University and has gone on to establish Jump the Hedges, a carry equipment company for the yoga consumer. The inaugural product, The Yoga Sac, which will be launched later this summer, is an innovative bag that carries a yoga mat in a streamline and functional way. The bag is both durable and water resistant and made from reclaimed waste material. Síofra has previously worked for Adidas in Germany, Levi's in San Francisco, Portwest in Mayo and most recently in a wearable technology company designing electronically integrated devices for muscle rehabilitation. Síofra returned to study at Ulster University to enhance her entrepreneurial and practical design skills with the long term goal of setting up her own business. Síofra said: "I always wanted to combine my passion for yoga with my creativity and practical design skills to start my own business. I used to live in San Francisco and while I was there took up cycling and yoga. I quickly discovered that carrying my yoga gear to class on the bike could be extremely awkward. "I searched for a solution but couldn't find anything on the market that met all my needs – lightweight, yet durable and spacious, but not bulky. This was the inspiration behind my masters project at Ulster University and ultimately my business. I wanted to design bags for active yoga consumers that were both functional and stylish. "The Yoga Sac is my first product to launch. It is a backpack that holds a yoga mat in a streamline and vertical way whilst not restricting the interior space of the bag. I am currently using water resistant waste material that would have otherwise gone to landfill. The leisure clothing industry is at an all time high, generating sales of $35 trillion dollars last year and accounting for 17% of the entire American clothing market. This is the industry I am aiming to tap into." The young entrepreneur was last year awarded the Ulster University Vice-Chancellor Award that provided funding to develop prototypes of the innovative yoga bag. With further support from Santander Universities, Síofra attended the largest yoga festival in the world, Bali Spirit Festival, where she gained invaluable in depth market research and feedback on her prototypes. She added: "The opportunity to attend the Bali Spirit Festival was integral for the development of Jump The Hedges. It allowed me to meet with internationally acclaimed yoga practitioners and gain important feedback on my products. I had huge interest from yoga boutiques in New York, Sydney and Melbourne who were keen to stock my products. "This is a hugely exciting time for me. I am in talks with manufacturers in Belfast and will be selling my first product online by the end of the summer. My aim is to create a transparent brand, built in Belfast that can be trusted by the global yoga community."